One of the best albums of 2001! 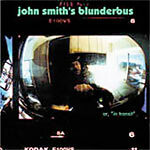 John Smith is one truly grumpy individual, a cynical poet with a chip on his shoulder. Smith's solo album came during a truly defining year in underground hip hop, amidst a wave of powerful releases. Its as if he had an epiphany, and when compared to the idea and logic behind what most would call a flawed design for a musket and highly innacurate, the Blunderbus perfectly captures the pessimism found in just about every song. While more comedic tones on the album like ''I'm Rollerblading!'' and ''Look Ma No Hands'' may seem out of place, its actually the humor in them that helps the listener understand where Smith feels most comfortable, in situations that exclude himself from others, a theme that is approached even more directly on ''Walk on By''. Mcenroe's production encapsulates the darker more depressing moods on ''Last Trip'' which is a song about death, and ''One Sided Trees'' takes us on a trip back home after a long absence, hitting hard on a personal note as he sees old faces, an ex-girlfriend and hides the pain of facing family and friends with intoxication. In conclusion, pop a prozac and wash it down with your liquor of choice and then throw this on, Blunderbus is like The Catcher In the Rye of hip hop, it's an album that may never leave your collection and deserves a listen at least once a year.